Monophysitism argues that Christ has only one nature, as opposed to the Chalcedonian position which holds that Christ has two natures, one divine and one human. 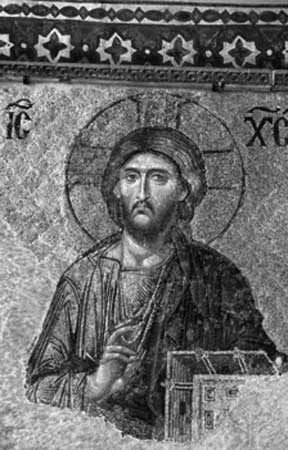 The belief of radical monophysitism (Eutyches) is that Jesus divinity absorbed his humanity. Christ’s humanity was "dissolved like a drop of honey in the sea." But, if Jesus isn't human then he didn't really die and rise, and we can’t be saved! Monophysites (in Christianity) believed that Jesus Christ’s nature remains altogether divine and not human even though he has taken on an earthly and human body with its cycle of birth, life, and death. The Christological position called monophysitism asserted that in the person of Jesus Christ there was only one, divine nature rather than two natures, divine and human, as asserted at the Council of Chalcedon in 451. In the development of the doctrine of the person of Christ during the 4th, 5th, and 6th centuries, several divergent traditions had arisen. Chalcedon adopted a decree declaring that Christ was to be “acknowledged in two natures, without being mixed, transmuted, divided, or separated.” This formulation was directed in part against the Nestorian doctrine—that the two natures in Christ had remained separate and that they were in effect two persons—and in part against the theologically unsophisticated position of the monk Eutyches, who had been condemned in 448 for teaching that, after the Incarnation, Christ had only one nature and that, therefore, the humanity of the incarnate Christ was not of the same substance as that of other human beings. Political and ecclesiastical rivalries as well as theology played a role in the decision of Chalcedon to depose and excommunicate the patriarch of Alexandria, Dioscorus (d. 454). The church that supported Dioscorus and insisted that his teaching was consistent with the orthodox doctrine of St. Cyril of Alexandria was labeled monophysite. The label also was attached to various theologians and groups, although some who were called monophysite, notably Severus of Antioch (d. 538), repudiated the terminology of Chalcedon as self-contradictory. Most modern scholars agree that Severus as well as Dioscorus probably diverged from what was defined as orthodoxy more in their emphasis upon the intimacy of the union between God and humanity in Christ than in any denial that the humanity of Christ and that of humankind are consubstantial. The churches that until the mid-20th century had been traditionally classified as monophysite, those of the so-called Oriental Orthodox communion, have always disputed the label, preferring the term miaphysite (from the Greek mia, “single,” and physis, “nature”) to identify their shared view that both divinity and humanity are equally present within a single nature in the person of Christ and describing their traditions as “non-Chalcedonian.” These Oriental Orthodox churches—the Armenian Apostolic Church, the Coptic Orthodox Church of Alexandria, the Ethiopian Orthodox Tewahedo Church, the Syriac Orthodox Partriachate of Antioch and All the East, the Malankara Syrian Orthodox Church, and the Eritrean Orthodox Tewahedo Church—have since resolved almost all of their Christological disputes with the Roman Catholic Church, the major Protestant churches, and Eastern Orthodoxy and have been generally accepted by those traditions as essentially orthodox in their doctrine of the person of Jesus Christ.